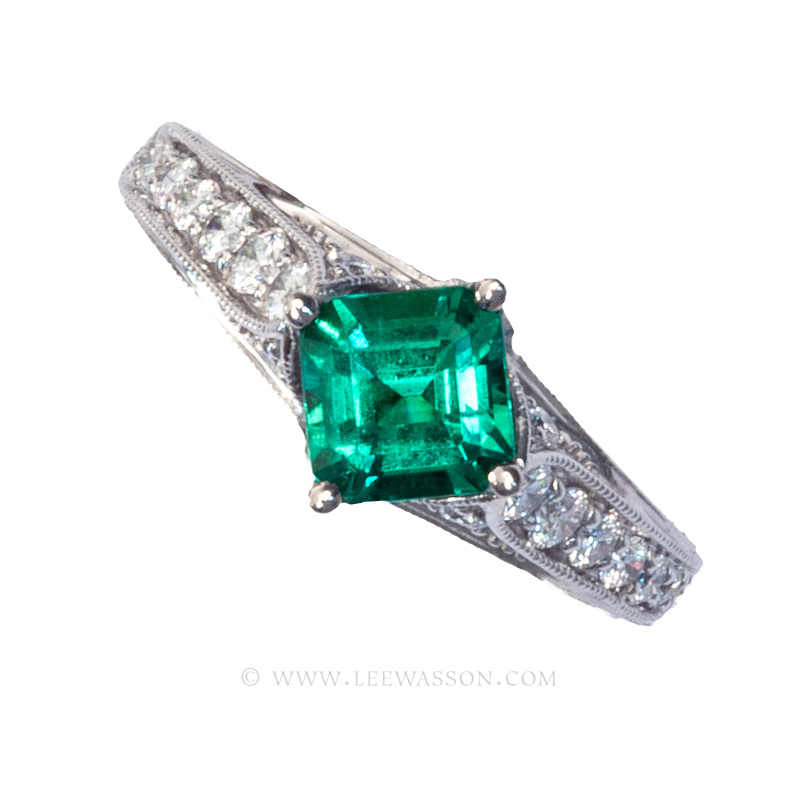 We Evaluate Colombian Emeralds Color against a White Background. Because white is a constant we can compare all emeralds against. 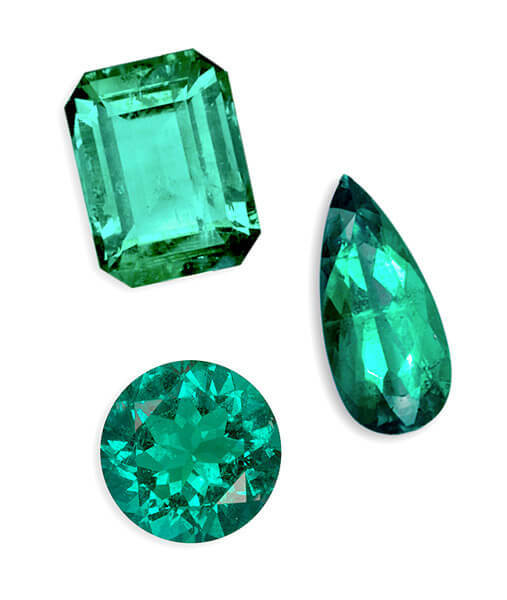 Emeralds are prisms cut with facets collecting and reflecting color from the environment surrounding it. 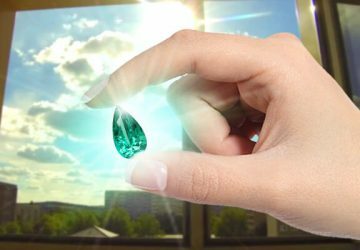 So, we in the Emerald industry minimize colors in the environment that will affect the quality of the Green we are trying to evaluate in a Colombian Emerald. holding the emerald with tweezers separates the stone from the color imparted by your fingers! See how to handle Emeralds HERE and watch: How to look at a Colombian Emerald. All of this isolates the Emerald from the surrounding Colors while we are observing it, illuminated by Sunlight. Quite a bit of technology behind looking at an emerald, isn’t there! 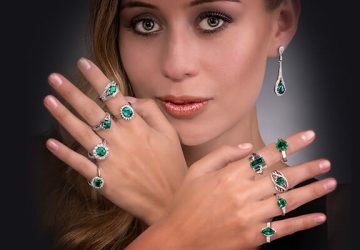 Colombian Emeralds are Cut to receive light from their surroundings through the Face or Top of the stone which is then reflected within the stone collecting the lovely Green color. Then, the Cut of the emerald concentrates and directs the light to exit through the Face of the emerald to delight you, the observer, as green flashes and sparkle. 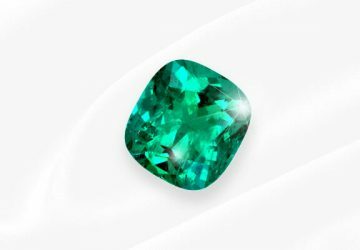 So, when you are looking at an emerald (held with tweezers not your fingers) you are seeing lots of green flashes of many different shades, tones and hues. All of which are sparkling at you as light refracts from within the stone. 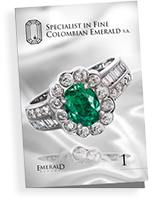 What do we want to know about a Colombian Emeralds Color? We want to know how deep of green it is, also it’s tone and hue. Yes, very much so, even for a professional such as myself with over 4 decades of experience. Every Colombian Emerald´s color is unique, its evaluation is subjective and requires years of experience, continuous viewing and comparison. Looking at an emerald face up as it will appear once set in a piece of jewelry, you really can’t define what color it is because it is constantly changing. Turn the Emerald over, upside down, and all the confusion goes away! 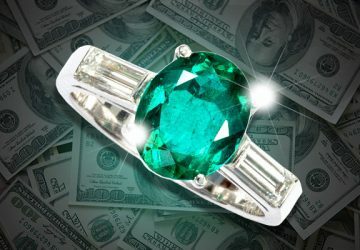 Notice that the stone is darker face up and lighter face down, what you see face down is the True Color of the Emerald. 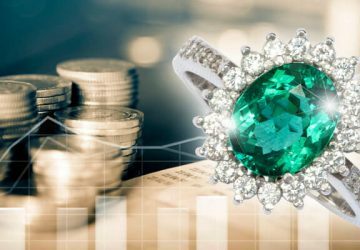 When you observe the stone Face down, NO facets are reflecting the beautiful but ever changing tone of the green flashes and sparkles. This allows you to determine the genuine Color of the emerald. Hold an Emerald with your tweezers about an inch over the white pad of paper and look through the bottom of the stone, if you don’t have emeralds to work with, go to another stone on our web site: HERE and look at this stone first face up then face down. Check out others stones, the color of all Colombian Emeralds will be lighter seen face down. What you see face down is the actual Color of the Emerald! Make a note of the Color you have observed. Now you have identified the Real Color of that Emerald. 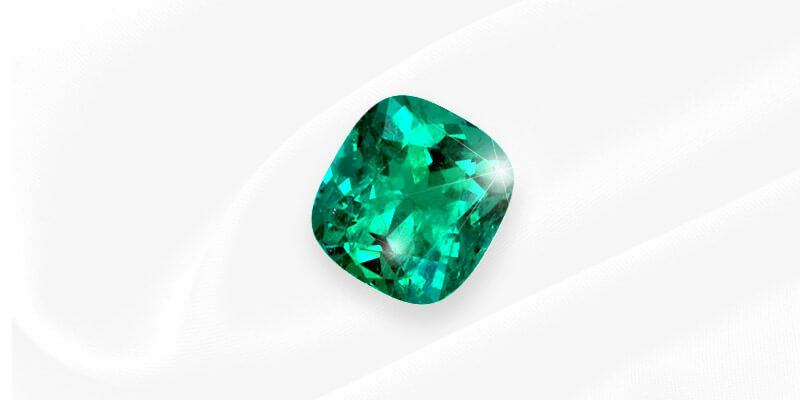 Compare that Color, to other emeralds under the same lighting conditions. Remember, place them upside down. Put the lighter emeralds to your left, face down, the darker ones to your right. Now lift them one at a time, 1 inch above the White pad. Observe and classify the emeralds in order from lightest to darkest. I classify them 1 Lightest to 10 Darkest for ease of discussing color with you. See how I classify Colombian Emerald rings by going to the Jewelry section of our web site HERE or the Loose Emeralds section HERE In front of each piece is my subjective Color Evaluation among other information. Press every line for more valuable information on each subject. You are now Color Grading Colombian Emeralds! All of a sudden you have created your own scale of Colombian Emerald Colors! You have acquired the hability to identify the True Color of an Emerald unaffected by color in the environment. 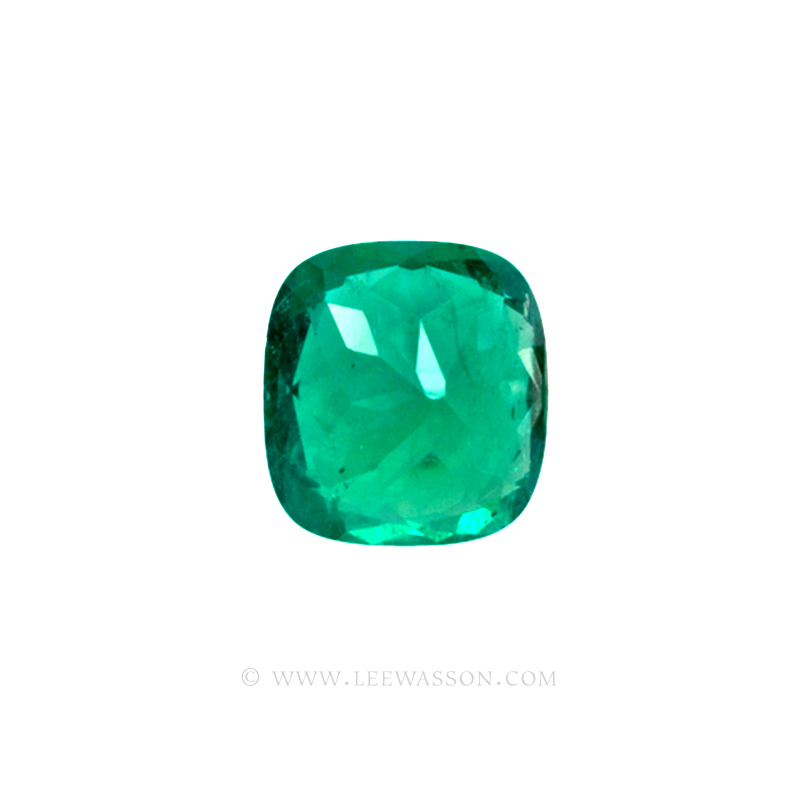 In our next Blog you’ll learn to identify Inclusions in a Colombian Emerald.